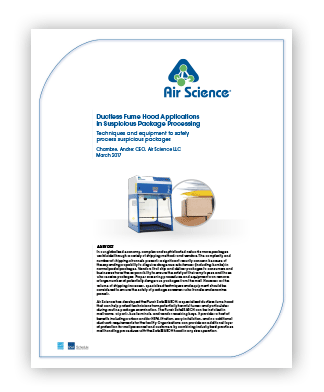 Air Science offers mail handling fume hoods to improve the safe handling and screening of envelopes and packages. Despite shipping regulations, fentanyl and other substances that are harmful when ingested, inhaled or absorbed are often sent, both legally and illegally, via mail. In addition to potential attacks through the shipment of anthrax and explosives, the shipment of fentanyl, drugs and pharmaceuticals puts mail handlers at risk when packaging is compromised. 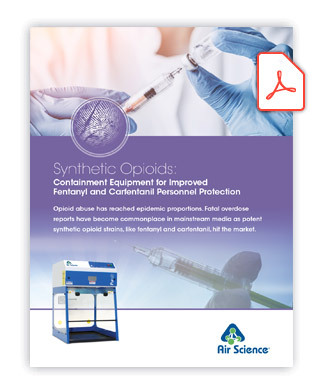 A life-threatening overdose from fentanyl and other synthetic opioids can happen with just one touch or the simple act of inhalation near a compromised envelope or package. While wearing latex gloves during the sorting and handling of mail can help lower risks to workers, the greatest threat comes from breathing in airborne particles. As fentanyl and other potentially harmful particulates are often too small to see, workers can be exposed without realizing it. To reduce the risk of exposure to airborne particulates and improve mail handling and mail screening safety, the proper containment hood is essential. 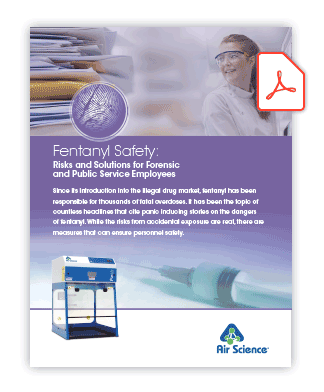 These fentanyl workstations allow for safe laboratory handling of fentanyl and reduce the risk of exposure. 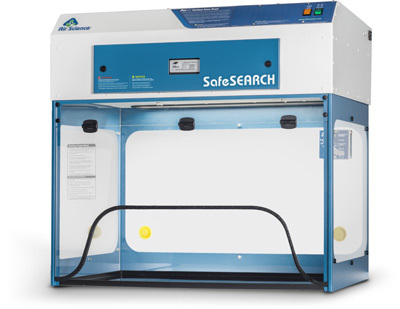 The Purair SafeSEARCH is a negative pressure containment system, or ductless fume hood. Negative pressure flow pulls particulates away from the handler while drawing air into the work surface and through the Multiplex™ filter. The Multiplex combines a broad spectrum, general purpose carbon filter with a HEPA/ULPA filter to capture drugs, chemical vapors, and other particulates with greater than 99.999% efficiency. The Purair SafeSEARCH provides ideal protection against exposure to fentanyl and other particulates and fumes that compromise personnel safety. 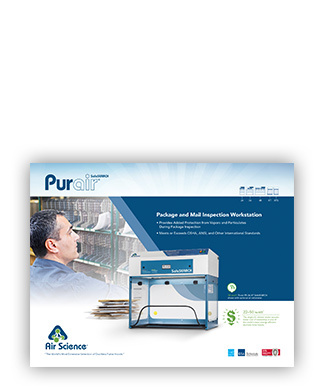 The specially designed ductless fume hood improves workplace safety by providing proper containment during the sorting and handling of potentially contaminated envelopes and packages. Air Science builds custom enclosures for your specific needs. Each unit is designed to maximize operator safety and accessibility, and is tested and certified to factory specifications and industry standards. We can easily adapt existing models to fit your unique application needs or design and construct a mail handling chamber for larger applications, including those using roll-in carts or requiring walk-in access. [i] US Department of Homeland Security. Interagency Security Committee. Best Practices for Mail Screening and Handling Processes: A Guide for the Public and Private Sectors. September 27, 2012. https://www.dhs.gov/sites/default/files/publications/isc-mail-handling-screening-nonfouo-sept-2012-508.pdf. Recent reports of suspected packages highlight significant security issues inherent to shipping packages and mail. The Department of Homeland Security (DHS) recommends filtered exhaust hoods or containment receptacles for the handling and screening of mail. Learn more about recommended procedures for fentanyl safety during mail inspection.